The Explorer raises the bar for an education computer headphone with dependability, quality construction and value. Its dynamic, thin Mylar® diaphragm speakers deliver high performance sound for higher quality reproduction of voice and music. It is trusted and widely used in typical mono functions (ELL / ELD, language labs, speech pathology) and stereo modes with computers, gaming and for music appreciation classes. The Explorer is ideal for use in computer labs and libraries in 1:1 applications and small group learning centers with educational software and is Windows and MAC compatible. The Explorer is very quiet due to its large ambient-noise reducing over-the-ear earcups that help keep students on task while minimizing the need to increase the volume. There are protective slotted baffles protecting the inner speakers against accidental puncturing from sharp objects (such as an unfolded paper clip). 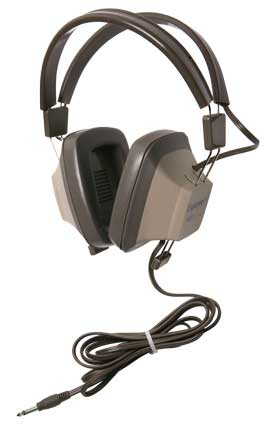 The earcups are connected by steel-reinforced dual headband straps which are designed to be equally comfortable when worn by younger students or for when used in adult education classes. The headbands have a “memory” feature that no matter how they're bent or twisted, they “remember” their original shape and spring back. The easy-to-clean cushions provide durability and lightweight comfort. Rugged plastic headstrap with recessed wiring for safety Steel-reinforced dual headstraps are fully adjustable to fit younger students and adults comfortably Noise-reducing earcups decrease external ambient noise Volume control conveniently located on ear cup (EH-3SV and EH-521 only) Replaceable 7' straight cord, 3.5mm plug, 1/4” adapter Slotted baffles protecting the inner All five Explorer headphones use its 7' replaceable cord with model choices of switchable/stereo/mono, ¼” or 3.5mm plug, earcup volume control or none.